Manju Jaidka, Professor of English at the Panjab University, Chandigarh, India delivered lecture on “Narratology across Culture” on October 26, 2010 in C V Raman Auditorium. Prof. Jaidka is a leading Indian academic, best known for her contribution to American Studies in India. Speaking in the programme, Prof. Jaidka demonstrated how motifs in stories across cultures resemble. She also urged and inspired the audience; mainly first and second year media studies students, to read the classics both for finding the motifs and using them for their creative work. The lecture was followed by reading from her upcoming novel. Organized by the Department of Languages and Mass Communication, the lecture was also attended by the Head and the faculties in the department. KU Joins hand with UNDP- ECHO initiates for Community Level training at Dolakha district. Kathmandu University is organizing Community Based Disaster Risk Management Training for Capacity Building in selected communities and Local administration level in Dolakha District of Nepal, RCRRP in the Himalayas, UNDP – ECHO initiative. The resource personsare from School of Engineering, School of Science, School of Management and School of Medical Sciences, Dhulikhel Hospital Kathmandu University. The program is being coordinated by Dr. Bim Prasad Shrestha, Associate Professor and Head of Department at Department of Mechanical Engineering of Kathmandu University and being provided in four thematic areas of Early warning system, Contingency planning, Search and Rescue and First aid for twelve consecutive days. The relevant resource materials are being provided by Nepal Red Cross Society, Practical Action Nepal, Action aid Nepal, Mercy Corps, and other DIPECHO members. The Environment Science graduate from Kathmandu University Ms. Rinu Karmacharya is providing logistic support for the participants and being assisted by Mr.Mahesh Bashistha, the recent graduate from the same department. The on site logistic support is being provided by ECARD, the local partner designated by UNDP/Nepal. Kathmandu University extends great appreciation to these organizations for their support. The training is being given to local community and district level office bearer of Nepal Police, Armed Police Force, Nepal Army, Nepal Red Cross, District development office, Soil conservations officers, local NGO federation, Water induced disaster officer, VDC secretaries and representatives from local communities of Suri Dovan, Laduk, Bhorle, Lamidanda VDC etc. October 23rd 2010 is the first day of the training program and inaugurated at Hotel Dobhan of Singati Bazar. In the Inauguration program, training coordinator Dr. Bim Shrestha welcomed all the participants on behalf of its organizer and shed light on mission and vision of Kathmandu University. Dr. Shrestha also thanked participants and UNDP Echo Initiatives for entrusting Kathmandu University to take such programs at door steps of local community. Project support officer of UNDP Mr. Deepak KC highlighted the importance of training program and expressed that partnership between Kathmandu University and UNDP will be further strengthened to bring such community level training program indays to come. The first day of training was given by Dr. Rijan Bhakta Kayastha on Early warning system and facilitatedby Mr. Sagar Dhital, the recent graduate of Human Biology at Kathmandu University. This is second time that Kathmandu University is organizing such training program at local level, the similar program was held in Bahunepati VDC of Sindhupalchwok during the month of August-September, where certificates of participation were distributed to the participants by Prof. Dr. Bhadra ManTuladhar, Registrar at Kathmandu University and Mr. Vijaya Singh, Assistant Country Director of UNDP/Nepal. Dr . Bal Chandra Luitelvisited the University of Wyoming (UW) from September 3 to 13 to participate inthe planning conference of WISDOMe (Wyoming Institute for the Study and Development of MathematicalEducation). At the conference, he presented a commentary on the plenary onlived mathematical experiences by Wolff Michael Roth. Besides, Dr. Luitelpresented a public lecture on transformative mathematics education in Nepal,met with officials of the university with a view to develop collaborationbetween KU and UW, and engaged in a series of discussion with Prof. LarryHatfield and other members of the DIME (Developing Investigations ofMathematical Experience) research team to (re) conceptualise research intolived mathematical experiences. Next,Dr. Luitel visited California State University @ Fresno (Fresno State) fromSeptember 14 to 19. He met professors of the Kremen College of Education so asto explore possibilities for future collaborations between KUSOED and theCollege of Education. Next, Dr. Luitel gave a public lecture entitled LookingBack, Looking Ahead: A Journeyfrom a Transmissionist Teacher to a Transformative Researcher, and a seminar onNew Science and New Mathematics to a group of graduate students and professors.He discussed with professors from the Department of Geography and School ofAgriculture regarding joint research activities between the two universities. AFresno State Professor is visiting KU in November so as to materialise thepossibility of joint research collaboration. Inthe final week (i.e., September 20 to 24) of the three-week tour, Dr. Luitelvisited California State University @ Sacramento (CSU Sacramento State) wherehe presented on some aspects of the ethnomathematics project supported by theUNESCO office in Kathmandu(http://unesdoc.unesco.org/images/0016/001614/161421m.pdf). The next talkcomprised Dr. Luitel’s ongoing research on socially responsible science andmathematics education. Toward the final day of the visit, he met professors andsome key administrators so as to identify some priority areas for futurecollaboration. Three research articles published and others edited by Dr. Subodh Sharma as Guest Editor with the theme Rivers in the Hindu Kush Himalaya – Ecology and Environmental Assessment are available online at www.springerlink.com in Hydrobiologia Volume 651. 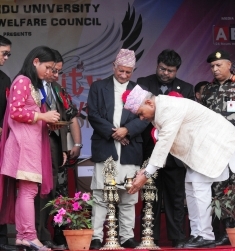 The Made in Nepal Youth SolidarityFestival was formally inaugurated on 24 September 2010, by Rt. Hon’ble Dr. Ram BaranYadav, the President of Republic of Nepal. On the same occasion,President Yadav also inaugurated the new Girls' Hostel and Staff Quarters inKathmandu University. Speaking at the inaugural ceremony, the President expressedhis concern that the education sector has been affected by the country’s politicalinstability. Stating that monopoly is not acceptable in democracy, he urged allpolitical parties to stay away from the politics of weapons for a peacefulfuture. He also advised the students to remain untouched by the stench ofpolitics. He praised Kathmandu University for its contribution towards highereducation in Nepal, congratulated for its international reputation, andexpressed the hope that this would continue for a long time ahead. Prof. Dr. Suresh Raj Sharma, theVice Chancellor of Kathmandu University, spoke about the achievements, setbacksand the satisfaction he felt during the twenty years of the university'sestablishment. Prof. Dr. Bhadraman Tuladhar, Registrar, Prof. Dr. Janga BahadurChauhan, Director of Student Welfare, Mr. Rajendra Khetan, Senate Member,industrialist Mr. Sanjeev Raj Rajbhandari, Constituent Assembly member Mr. KrishnaPrashad Sapkota were among the other dignitaries to formally attend the ceremony.Besides, Deans of different schools, faculties, staffs, and families living inthe staff quarters were also present in the programme. The ceremony was chaired byMr. Sharad Chandra Mainali, President, Student Welfare Council president. The festival which runs forthree days will have activities like youth conference, cycle race, photo exhibitionand competition, art exhibition and science project exhibition. There are alsofood and game stalls at the fair. Please download the [pdf] file. Please download the [doc] file to view conference schedule with session allocations. Uttam Budhathoki, Assistant Professor and Dr.Rajendra Gyawali, Lecturer, Department of Pharmacy, have been elected as aPresident and Member respectively in 36th Annual General Meeting of NepalPharmaceutical Association (NPA) on Saturday, 28 August 2010 for next threeyears tenure. Mr. Bibek Singh Mahat and Mr. Prawan Dahal, both MPharm Students,have been elected as General Secretary and Member respectively in the AGM. Kathmandu University is organizing Community Based Disaster Risk Management Training for Capacity Building in selected communities and Local administration level in Sindhupalchowk and Dolakha District of Nepal, RCRRP in the Himalayas, UNDP – ECHO initiative. The resource persons are from School of Science, School of Management and School of Medical Sciences, Dhulikhel Hospital Kathmandu University and Nepal Engineering College affiliated to Pokhara University. The program is being coordinated by Dr. Bim Prasad Shrestha, Associate Professor and Head of Department at Department of Mechanical Engineering of Kathmandu University and being provided in four thematic areas of Early warning system, Contingency planning , Search and Rescue and First aid in both the districts. Kathmandu University extends great appreciation to these organization for their support. The training will be given to local community and district level of office bearer of Nepal Police, Nepal Armed Police, Nepal Army, Nepal Red Cross, District development office etc. This is first of its kind that Kathmandu University is organizing the training at local level and contract has been awarded to Kathmandu University on competitive basis. August. 31st 2010 is the first day of the training program and inaugurated at Melamachi Diamond Resort of Bahunepati. In the Inauguration program, training coordinator Dr. Bim Shrestha welcomed all the participants on behalf of its organizer Kathmandu University. Project support officer of UNDP Mr. Deepak KC highlighted the importance of training program and also shed light on UNDP ECHO initiative activities for hydro metrological disaster management being carried out in Nepal. The first day training was given by Dr. Rijan Bhakta Kayastha on Early warning system and his training is being facilitated by Ms. Rinu Karmacharya at Bahunepati VDC of Sidhupalnchok district. Please [ click ] link to download the pdf file to view the list. The students of Masters in Electrical Power Engineering batch 2008-10 under NOMA Fellowship Program received their Certificate o f Degree in the Graduation Ceremony organized by the School of Engineering, Kathmandu University on 29th June 2010 at the C.V. Raman Auditorium, KU. On this auspicious occasion, His Excellency Thor Gislesen, Honorable Norwegian Ambassador to Nepal, was the Chief Guest, who congratulated the graduating students and wished them bright future. Vice Chancellor of Kathmandu University, Prof. Dr. SureshRaj Sharma, awarded the degree to the students and on his congratulatory speech wished the graduating students a successful future. The program officially began with a welcome speech from the Registrar of Kathmandu University, Prof.Dr. Bhadra Man Tuladhar. The NOMA Program Coordinator Mr. BrijeshAdhikary highlighted about the past present and future of NORAD and NOMA Program, its background and success. On behalf of graduating students Mr. Patrick Mukombe Simuchimba presented his views about the MEEPE NOMA program and express his gratitude towards KU, NTNU. Finally, Prof.Dr. Bhola Thapa, Dean of School of Engineering, extended vote of thanks. Distinguished guests from different industries and organization, journalists, local people representatives, faculties and staffs of Kathmandu University were present in the program. Uttam Budhathoki, Panna Thapaand Ellaiah Poluri published a paper entitled "ProductionOptimization and Partial Characterization of Xylanase from Brevibacillusborstelensis – MTCC 9874 Isolated from Soil Sample of Eastern Nepal and itsMedium Optimization" in Journalof Pure and Applied Microbiology, Volume 4 No. 1 Page No. 01-09.